Believe it or not, this was only the second time I’d driven a MINI of any sort. Frankly, I don’t know how I managed not to drive more of them. Back in 2005, I briefly drove a friend’s normally aspirated MINI Cooper and remember car’s quick reflexes and great driving dynamics. It wasn't big on power, but it was big on personality and agility. 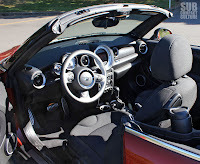 The 2013 MINI Cooper S Roadster is big on all that stuff, adds some grunt to the equation, and can transform into a drop top. 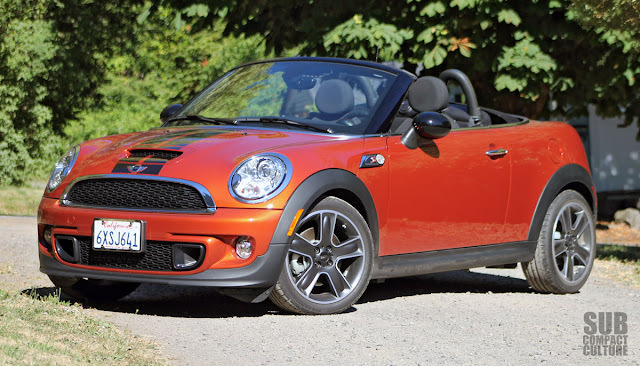 Remember, MINI offers both a Convertible and a Roadster. The difference? 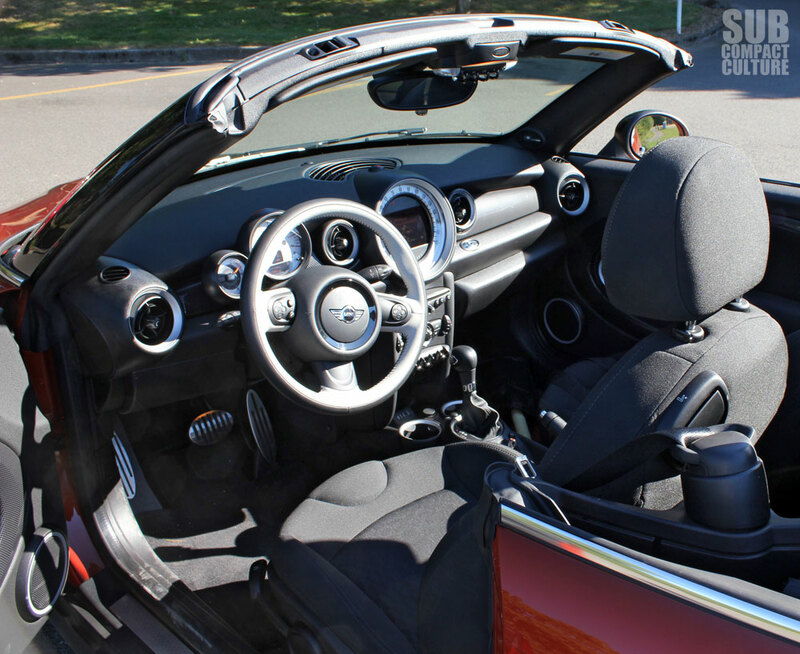 The MINI Convertible seats four, has a top that runs clear to the back of the vehicle, and has a tiny liftgate at the back for cargo. The Roadster seats two, has a top that folds behind the seats, and has a small but usable trunk. With the top up, the Roaster has a unique look with somewhat bizarre proportions. We find it much more attractive with the top down, where its lines are clean and minimal. Putting that top down is simple, too. Twist a knob to unlatch the top from the windscreen, push the top back about six inches, then hold the switch at the windshield’s front, and the electric top lowers itself into position. The Roadster features two roll hoops behind the seats, a squared-off trunk, and no semblance of a top (with it down), since it retracts to a nearly flush state. By the way, there is a semi-hidden deck-mounted rear spoiler, but it’s speed sensitive and only comes up at highway speeds. Slow down and it retracts into the deck lid upon stopping. And for your boy-racer types, you can flick the spoiler up using a switch inside the vehicle if you must have it up even at slow speeds. MINI has been criticized for its quirky interiors and ergonomics, and after spending a week with this diminutive drop top, I can see why. First the good: The interior feels very solid and mostly composed of high-quality materials. The center-mounted LCD screen is operated with a small joystick mounted right behind the gear shift. My right hand fell perfectly onto this little nub, and after a bit of getting used to, the system works well to navigate channel changes on the stereo, navigation preferences, and all of the other menus displayed on this panel. Additionally, I found the seats supportive and comfortable with ample bolstering . By the way, unlike the MINI Cooper Convertible, the Roadster has a usable trunk. You can get a suitcase in there or a couple of duffle bags for a weekend getaway. You might even be able to get a set of golf clubs in there. Now the not-so-good: That center-mounted LCD screen has the speedometer in the bezel. The needle, if you will, moves around the perimeter, and it’s hard to read and feels alien. Thankfully, there is a tiny digital speedometer in the large tachometer, which is mounted above the steering column. To the left of the speedometer is a gauge I was unfamiliar with. At first I thought it was some funky clock. I could NOT figure out what the hell this was. I consulted the manual to find it the top-down timer. Yes, this prominently featured gauge simply displays how long you’ve had the top down while driving. I found it to be useless. Additionally, the climate control system, with its vertical wheels, is a bit funky to operate. Finally, the window switches are located at the bottom of the center stack, and are often difficult to get to, especially if you had a beverage in the cup holder. I remember my dad saying to me at a young age that a car stereo always seems to sound better in a convertible. Well that’s definitely the case here. The MINI’s Harman/Kardon sound system is flat-out phenomenal (top down or top up). With the top down at 60 mph, you can crank the stereo and it sounded as good as it does parked. 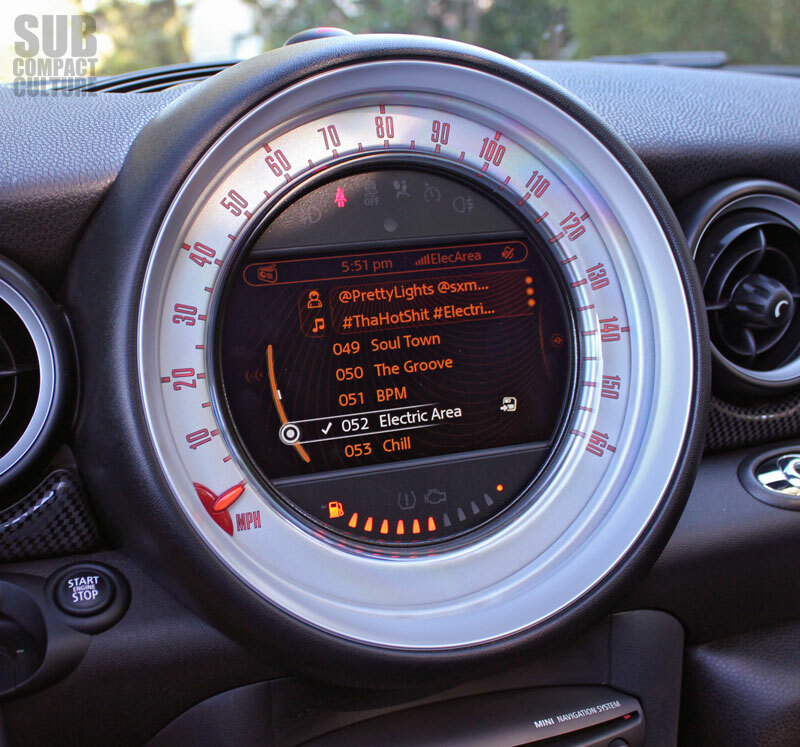 Our MINI Cooper S Roadster was equipped with a six-speed automatic transmission. Acceleration is brisk, but would be more brisk with the six-speed manual. Being the S model, our MINI showcases a turbocharged 1.6-liter engine making 181 horsepower and 177 ft/lbs or torque. Power is definitely abundant, and even with the automatic, the car is no slouch. Amazingly, torque steer is kept in check, and power delivery is linear. 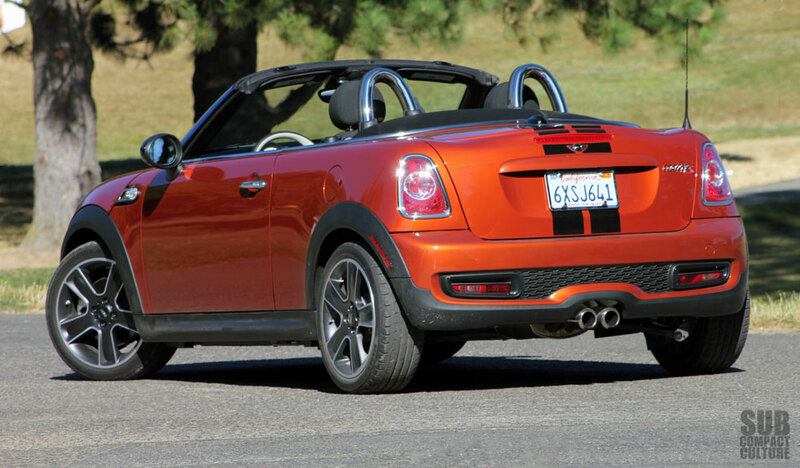 I've always been a fan of the MINI's center-mounted dual-tipped mufflers, and the Roadster's is no exception. There's even a nice exhaust note, especially noticeable with the top down. Rated at 26 city, 29 combined, and 34 highway, the MINI isn’t a fuel miser, instead leaning towards the performance end of the spectrum. I was able to maintain just under 27 mpg in about 60% city driving. This car rides stiffly, there’s no doubt about that. 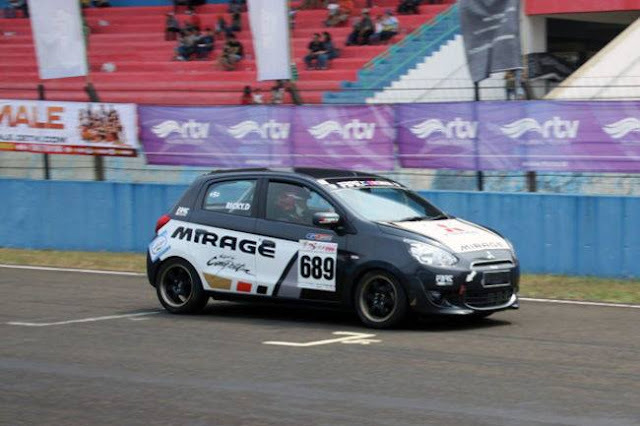 After all, this is the sporting version of the MINI. 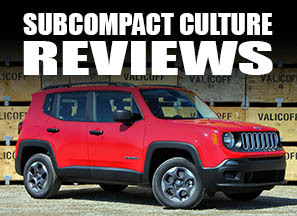 However, the chassis gets rather unsettled over bumps and potholes, and the suspension delivers rubbery kickbacks, and there was noticeable cowl shake. But in the corners, the MINI comes into its own, and delivers that driving experience the marque is heralded for. It’s as nimble and light on its feet, just as a car with the name MINI should be. Steering input was very good with a quick ratio and great feel. Yes, this car loves the corners, as I was hoping it would. One thing: With the top up, rear outward visibility is awful. The combination of a tiny rear window and expansive fabric between the side window and rear window makes for daunting lane changes and reversing. While poor rear visibility is often an issue in convertibles, it seems worse than average in the Roadster. Our test model came in at a whopping $35,345, which includes $500 for the Spicy Orange paint and $795 for destination. I found it odd that for that price you didn’t get things such as leather upholstery or heated seats. That’ll cost extra. In fact, I built a fully loaded MINI Cooper S Roadster and the price came to $39,095, and that’s without any of the high-performance John Cooper Works parts. And, by the way, you could opt for the faster 208 hp John Cooper Works MINI Roadster, which I was able to option up to $46,445 on MINI’s website. To me, the MINI Roadster definitely has its highs and lows, and is full of quirks. While it’s a lot of fun to pilot with the top down and the stereo up, its interior oddities, polarizing shape (with the top up), rough ride, and hefty price tag kept me from falling in love with it. Plus, I kept thinking about the Mazda Miata variable. A similarly equipped Miata Grand Touring with the power retractable hard top, automatic transmission, and, of course, rear wheel drive will top out at $33,330 including destination. No, it isn't turbocharged, and it has a much different persona than the MINI Roadster, but it is stiff competition against this British-built drop top. I never liked the Mini dash. I didn't think they could get worse. I was wrong.